I struggle to keep up with my chores. I procrastinate. I spend my time practicing escapism rather than being productive. My nature of sensible hedonism could typically be expressed in pseudo Spanish as “mañana”. It’s terrible… I know. I also know that I am, like most people, exceptionally malleable… just look at my visual management, willpower and weight loss post… it’s 5.5 months later and I’m still down 18.1 pounds, simply by weighing myself daily on a fancy, graph generating scale… scary! But what to do about all those commitments I most recently refactored in my post on personal commitments, “The Speed of Trust”, and poster art? Is there something I can do to help with them? 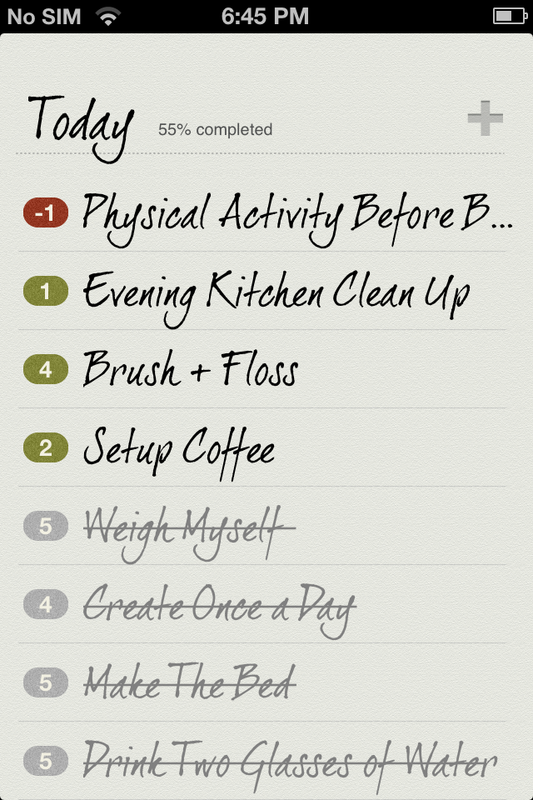 Fortuitously after a few search attempts I happened upon Habit List an inviting, balanced, skeuomorphism rich app. Habit List elegantly adds visual management to your recurring to-do list. Red dots along the left margin indicate you are not delivering on your commitments. Green dot’s mean you are doing well. The number centred in the dots indicate how many times you’ve either made or missed your commitment in the current streak. 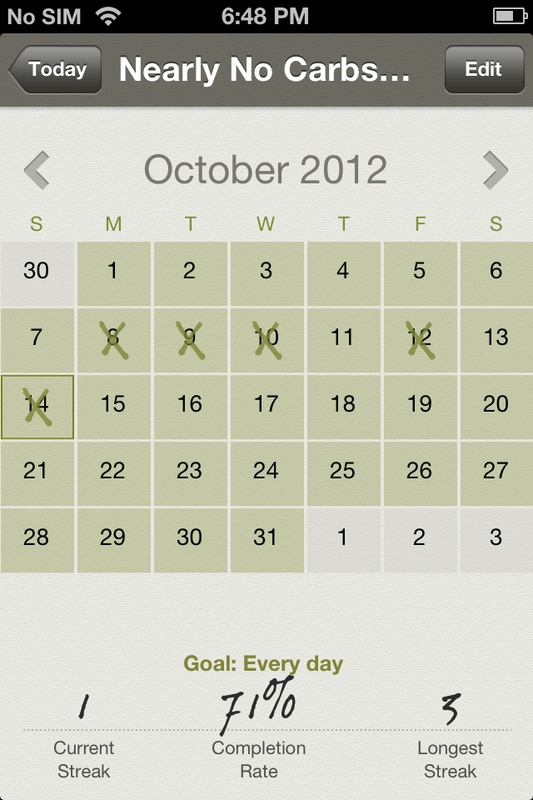 Each habit has its own exploded calendar view where details of your best streak, your current streak and your current completion rate are displayed. After just a week of using Habit List I’m addicted. Scratching items off the list feels rewarding. Daily reminders are much needed motivation and I’ve already grown my list of personal commitments. I am pleased to bestow 4.5 out of 5 stars on Habit List. There’s just one or two things missing. Though the app has flexible scheduling options it’s still not enough. Working 9 out of 10 weekdays, and having some commitments that are only applicable when I am at home mean I either artificially pad or compress my streaks. I think there needs to be a “Not Applicable” option, perhaps only accessible from the calendar view, that allows the user to opt ad-hoc days out of the calculation of streaks for a specific habit. Also the ability to “snooze” reminders would help me procrastinate… I mean meet my commitments! Habit List is well worth the $1.99. Do yourself a favour, get this app and start a routine of completion, you’ll be more productive and have fun while crossing things off your list.